I recently came across this Egyptian spice blend of nuts and toasted seeds which is typically used as a dip with bread or fresh vegetables. Take a piece of bread, dip in olive oil and in Duqqa, eat and repeat. It is a warm and aromatic mixture and according to Google, very addictive! Use with meat, burger, sandwich, pasta, salad, yogurt, Arabic coffee ( I add it to tea also) …. let your imagination go wild. 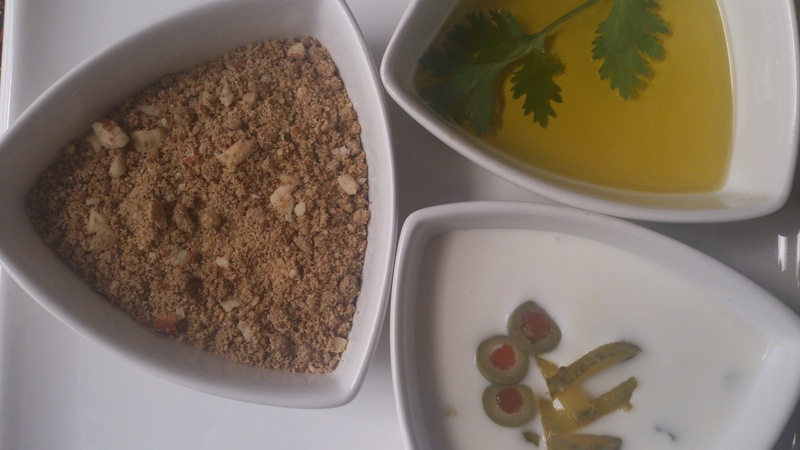 I served a kebab platter with duqqa, olive oil and pickle raita (yogurt). It was awesome! I am gonna try it with ice cream too. Last month I joined Bloggers Monthly Fiesta, a group creative food bloggers. One ingredient is picked and all participants post a dish using it. For September the theme was “fruit” and I posted Banana and caramel bread pudding. For October it is “nuts”. Place almonds and sesame seeds onto a baking tray and bake for 5-7 minutes at 180 C/ 350 F until golden. I do it without preheating the oven. Leave to cool. In a small frying pan combine coriander seeds and ground cumin. Cook for 30-40 seconds, stirring continuously to avoid burning till fragrant. Add cinnamon powder and let it cool down a little. Add crushed black pepper to a food processor/ dry mill. Add almond and sesame mixture and coriander mixture. Pulse until coarsely chopped. Add salt and mix. Store at room temperature in an airtight glass container. I used unblanched almonds. If you prefer blanched it is your call. Adjust the spice level as you like. Add 1/2 tsp of red chilli flakes for an extra punch. Thanks Rafeeda. You can literally anything even tea or coffee. Love this mix.. sounds delicious and amazing.. Thank you! This is so sweet of you. This sounds great! I have never heard of something like this. Thank you! I plan on it. I feel like I need a cookbook for the great recipes that fellow bloggers share! Sounds new….Love the bundle of flavours in the recipe…. You know what i mean.. ! !